Nice of you to stop by for maybe a minute or so. Was I not welcoming enough? Did my three batches of pumpkin cookies, one batch of pumpkin muffins and my huge pot of sweet potato soup not convince you to stay?! 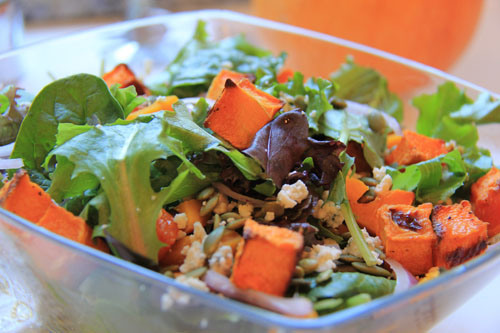 Categories: Pumpkin, Salads, Vegetarian | Tags: butternut squash salad, maple roasted pumpkin, pumpkin salad, Real Simple butternut squash salad | Permalink.